Saturday Mornings are the only mornings when the whole family is together and there isn’t a huge rush to go anywhere. It’s the morning that my family looks forward to. I always make delicious breakfast spread but on some days it can be very time consuming. I like making Ham and Cheddar Shredded Hashbrowns for breakfast and I like to use Simply Potatoes®. They require no washing, no peeling, and shredding. Their shredded potatoes are made with real ingredients and they’re easy to prepare. 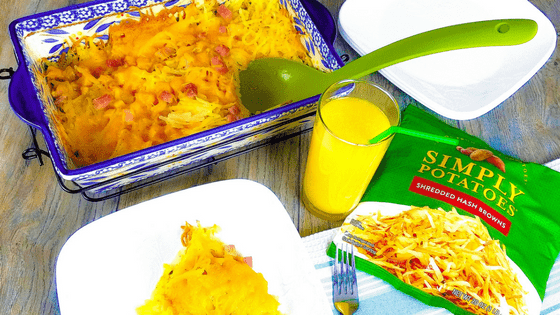 My go-to dish is my Ham and Cheddar Shredded Hashbrowns Breakfast Casserole. It’s quick, easy, and satisfies everyone’s appetites. How delicious isn’t the best part of this dish; it’s that it has very little hands-on time. I use Simply Potatoes because they are simply made with always fresh, never frozen potatoes that go from farm, to fridge, to fork. I don’t have to worry about the extra prep work it would take using whole potatoes- that means more time with my family! Saturday mornings are for family time, giggles, and making memories. As a mom, I miss out on a lot of that time because of the time spent in the kitchen. Spending as much quality time that I can with my family is high priority on my list and making this dish makes that quality time more possible. The prep for this dish takes less than 10 minutes and it’s so simple because the oven does all the work. It’s quick, easy, and it is delicious! My go-to dish is my Ham and Cheddar Shredded Hashbrowns Breakfast Casserole. It's quick, easy, and satisfies everyone's appetites. The best part about the dish is that it has very little hands-on time. I use Simply Potatoes because they are simply made with always fresh, never frozen potatoes that go from farm, to fridge, to fork. I don't have to worry about the extra prep work it would take using whole potatoes and that means more time with my family! Melt butter and mix with shredded hashbrowns in dish. Stir in onion and sprinkle in salt and pepper. Mix in 2/3 of shredded cheese. Mix in 2/3 of diced ham. Sprinkle remaining cheese and diced ham. Bake for 40 minutes, serve warm. Ooooh those look like the perfect breakfast casserole. I loooove shredded potatoes. Definitely going to give this a try- looks pretty quick and easy. I love funeral potatoes. Anything with a crunchy cornflake topping is alright by me! They look delicious! My favorite guilty pleasure is scalloped potatoes! Potato salad is my favorite potato dish. We mix it up by dding different ingredients, like bacon, or substituting ranch instead of mayo.